The historical fact of the Battle of the Little Bighorn has, over the years, lent itself to a myriad of myths and conjectures. Many of the basic facts are well documented: the fact that Lieutenant-Colonel George Custer was in command; that the command was irrationally divided; that 261 men of all ranks were killed. 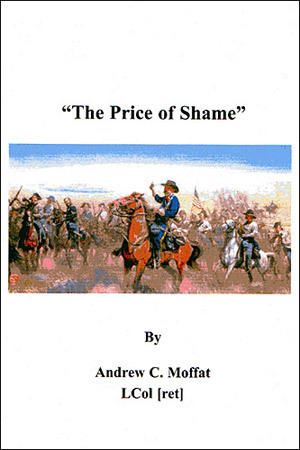 Most details concerning the battle are found in the oral history of the Lakota Indians. Even among those ‘facts’ remains hidden one of the great unexplained mysteries of the affair — the bodies of the three Second-Lieutenants were never found — they, and they alone, remain an enigma! This fictional story — based on the actual fact of the ‘disappearance’ of one of those young officers — portrays an entirely reasonable explanation for the absence of his body. It is, so to speak, a most unusual mystery. He rode forward cautiously, in the direction of the sounds of battle. As he came to the first rise he was able to see the final stages of the General’s defeat. Eric had not ever imagined that so many Indians existed — they were everywhere and seemed to be growing in numbers even as he watched. Panic hit Eric! Panic such as he had never imagined man could feel. Panic that drove all reason and logic from his mind. “Save yourself — save yourslf” a voice kept saying. He knew that honour demanded he seek out his comrades, even if it meant certain death. He knew perfectly well what his father and his grandfather would do. His mind was filled with complete confusion! Then, as he sat in a state of frozen fear, he realized that he was facing a group of Indians racing towards him from the site of the battle. It is a wonderful book… maybe your best yet! As usual, you got to (my) emotions twice — once at Christmas and the other with the President. You did a great job of contrasting the differences in leaders and developing the characters as you did.